Trane’s split system air conditioning and heat pump outdoor units all have fully louvered panels to protect the outdoor coil from damage, as well as tough powder paint finishes and weather-resistant screws. Trane also offers the patented all-aluminum Spine Fin™ outdoor coil. The Spine Fin™ outdoor coils provide greater heat-transfer capabilities, thus resulting in higher efficiencies and greater resistance to corrosion than traditional copper/aluminum coils. Trane’s XL20i model is among the highest SEER ratings (cooling efficiency) systems in the industry. Trane manufactures furnaces, air conditioners, ductless mini-split systems, packaged units, controls, heat pumps, air handlers and more. Many of which are energy star qualified. Trane does not group its products into a “series” but rather uses model numbers based on the different categories of products. By comparison the models are grouped similar to other brands though. The XB13 is 13 seer + is not energy star rated, single stage compressor, and has a 10-Year Compressor, 5-Year Coil, 5-Year functional parts warranty*. The XB14 is up to 16 seer, is energy star rated, is also a single stage compressor, but has a 10-Year Compressor, 10-Year Coil, 10-Year functional parts warranty*. The XL15i is also up to 16 seer, energy star rated, single stage compressor, is slightly quieter, and ups the warranty* to 12-Year Compressor, 10-Year coil, 10-Year functional parts. The high end XL20i is up to 20 seer, energy star rated, two compressors, slightly quieter, has the 12-Year Compressor, 10-Year coil, 10-Year functional parts warranty*, and also adds the ability to communicate while using the Comfortlink™ line of thermostats. Trane requires all products to be registered for full warranty* coverage. When it comes to installing, servicing, or repairing a Trane air conditioner or furnace choose the experts, Max Mechanical. We service Arlington, Dallas, Fort Worth and the entire DFW area. 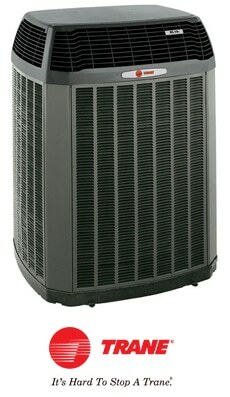 Do you need a price quote on the installation of a new Trane air conditioning unit in your home or business? Call 817-459-4100 or contact us online for a free estimate. Are you looking for replacement parts for your Trane HAVC or furnace? Call Max Mechanical, the Trane replacement specialists, at 817-459-4100 or contact us online for a price quote.